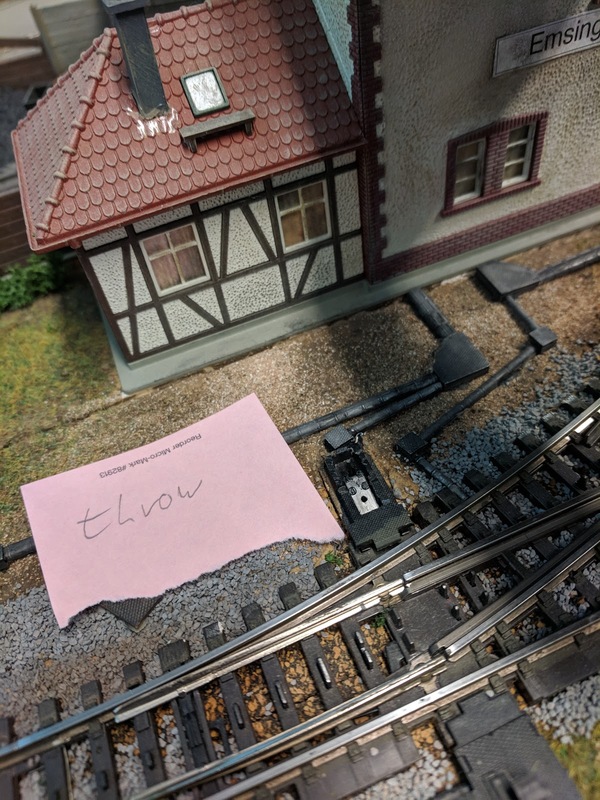 One of QuadP servo decoders I use on the Welztalbahn lost its mind a little while ago, which caused it to not only forget its address, but also the servo programming. Hence all servos returned to their neutral position. In one turnout I didn't pay enough attention during install and the neutral position was away from the turnout hole. As a result the actuating rod from the servo popped out of the turnout throw and I spent two hours today fixing that, as well as reprogramming all four turnouts. This QuadP is the first servo decoder I installed on the Welztalbahn. When installed originally, it was easy to reach and very convenient. However, with Emsingen station built, tunnel walls, scenery etc. it's now quite hard to reach when trying to see turnout points for alignment. That made it much harder to get those turnouts back into working order. Lesson learned: Mount those control boards in locations that are easily reachable even after the planned scenery is built. Meanwhile, Tam Valley Depot followed through on my wish and released the QuadLN-S decoder which has LocoNet, as well as support for a remote alignment tool. Looks like it's time for an upgrade.